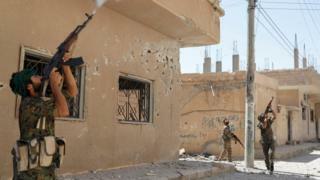 Turkey’s president has strongly rejected US calls for his country to protect Kurdish fighters in Syria. President Recep Tayyip Erdogan said such statements made by US National Security Adviser John Bolton at the weekend were “unacceptable”. He is in Ankara to seek guarantees that members of a Kurdish militia battling the Islamic State group will be safe after US troops backing them pull out. Turkey regards the People’s Protection Units (YPG) as a terrorist group. On Tuesday, Mr Erdogan told MPs from his governing Justice and Development Party that he could not “accept and swallow” Mr Bolton’s message. He considers the YPG an extension of the banned Kurdistan Workers’ Party (PKK), which has fought for Kurdish autonomy in Turkey for three decades. The YPG denies any direct organisational links to the PKK. Why is the US withdrawing from Syria? In 2014, militants overran 100,000 sq km (39,000 sq miles) of Syria and neighbouring Iraq, and imposed their brutal rule on almost 8 million people. Now, they control only 1% of the territory they once had. 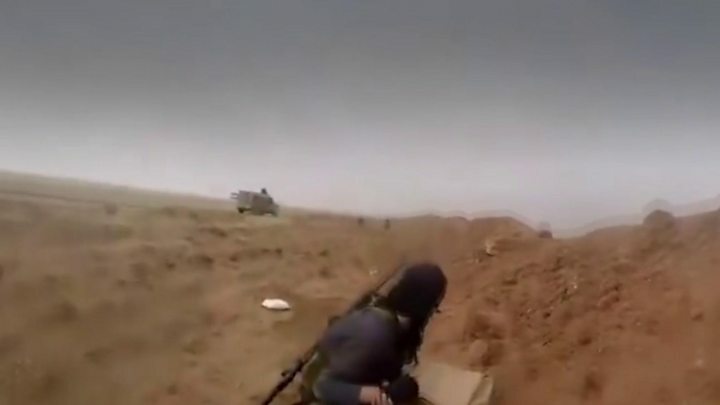 Media captionIs this the Islamic State group’s last stand in Syria? However, the defeat of IS is far from final. A US defence department report estimated in August that there might be as many as 14,000 jihadists left in Syria and 17,000 in Iraq. 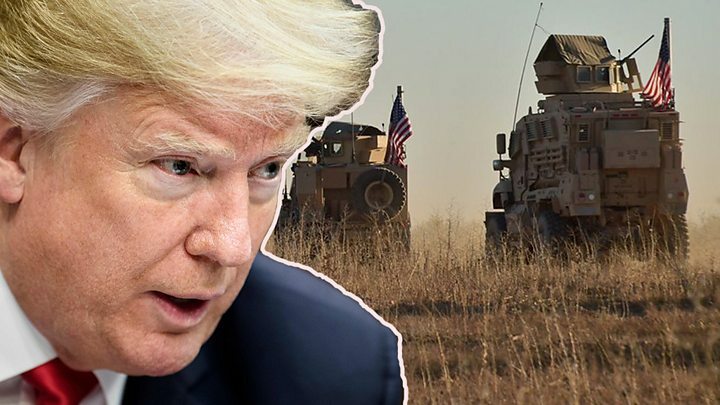 President Donald Trump consequently shocked allies and faced strong criticism at home last month when he ordered US forces to immediately begin withdrawing from the approximately 30% of Syria controlled by the YPG-led Syrian Democratic Forces (SDF) alliance. Over the weekend, Mr Bolton laid out several conditions for the withdrawal, which suggested that the four-month schedule agreed by Mr Trump could slip. He told reporters in Israel that it would be done in a way that guaranteed IS “is defeated and is not able to revive itself”, and that the US would “take care of those who have fought with us against [IS] and other terrorist groups”. US-Turkish talks in Ankara over the withdrawal of US troops from Syria were expected to be tense after Mr Bolton’s comments about the YPG. But no-one really contemplated that President Erdogan would speak in such blunt terms. Mr Erdogan said it was impossible to swallow Mr Bolton’s comments suggesting that Turkey should agree to protect YPG forces as a pre-condition to the withdrawal. He said Turkey would do whatever it takes to kill terrorists, adding that an operation in the Kurdish-controlled area in northern Syria would take place soon. Ankara sees the YPG as a national security threat. But Washington wants to reassure the Kurds over the Turkish threat, so they don’t feel obliged to cosy up to Russia. How did Mr Bolton’s talks in Ankara go? He met Mr Erdogan’s aide, Ibrahim Kalin, on Tuesday morning to discuss how the US withdrawal could take place. Later, Mr Kalin told a news conference that he had asked Mr Bolton about the heavy weapons and facilities that the US had handed over to the YPG. “We expect that all the weapons that were given out will be seized,” he said. “We should not allow the withdrawal process to open new opportunity fields for terror organisations, including the YPG,” he added. Mr Kalin also said that Turkey would not seek permission from anyone to carry out military operations in Syria, amid reports that it is preparing to attack the northern town of Manbij to force the YPG to move east of the River Euphrates. Some 2,000 US military personnel are reported to be deployed in Syria.